57 This was the list of the Levites according to their clans: of Gershon, the clan of the Gershonites; of Kohath, the clan of the Kohathites; of Merari, the clan of the Merarites. 58 These are the clans of Levi: the clan of the Libnites, the clan of the Hebronites, the clan of the Mahlites, the clan of the Mushites, the clan of the Korahites. And Kohath was the father of Amram. 59 The name of Amram's wife was Jochebed the daughter of Levi, who was born to Levi in Egypt. And she bore to Amram Aaron and Moses and Miriam their sister. 60 And to Aaron were born Nadab, Abihu, Eleazar, and Ithamar. 61 But Nadab and Abihu died when they offered unauthorized fire before the Lord. 62 And those listed were 23,000, every male from a month old and upward. For they were not listed among the people of Israel, because there was no inheritance given to them among the people of Israel. 26:57And these are they that were numbered of the Levites after their families: of Gershon, the family of the Gershonites: of Kohath, the family of the Kohathites: of Merari, the family of the Merarites. 26:58These are the families of the Levites: the family of the Libnites, the family of the Hebronites, the family of the Mahlites, the family of the Mushites, the family of the Korathites. And Kohath begat Amram. 26:59And the name of Amram's wife was Jochebed, the daughter of Levi, whom her mother bare to Levi in Egypt: and she bare unto Amram Aaron and Moses, and Miriam their sister. 26:60And unto Aaron was born Nadab, and Abihu, Eleazar, and Ithamar. 26:61And Nadab and Abihu died, when they offered strange fire before the LORD. 26:62And those that were numbered of them were twenty and three thousand, all males from a month old and upward: for they were not numbered among the children of Israel, because there was no inheritance given them among the children of Israel. 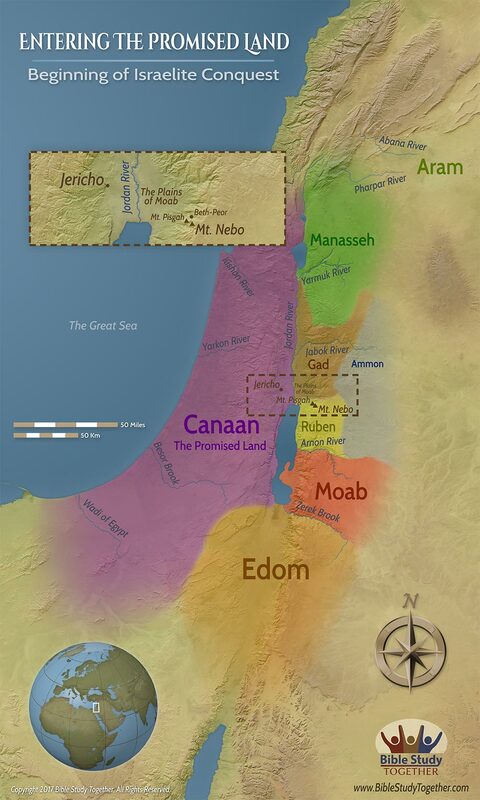 26:63These are they that were numbered by Moses and Eleazar the priest, who numbered the children of Israel in the plains of Moab by Jordan near Jericho. 26:64But among these there was not a man of them whom Moses and Aaron the priest numbered, when they numbered the children of Israel in the wilderness of Sinai. 26:65For the LORD had said of them, They shall surely die in the wilderness. And there was not left a man of them, save Caleb the son of Jephunneh, and Joshua the son of Nun. 27:1Then came the daughters of Zelophehad, the son of Hepher, the son of Gilead, the son of Machir, the son of Manasseh, of the families of Manasseh the son of Joseph: and these are the names of his daughters; Mahlah, Noah, and Hoglah, and Milcah, and Tirzah.27:2And they stood before Moses, and before Eleazar the priest, and before the princes and all the congregation, by the door of the tabernacle of the congregation, saying,27:3Our father died in the wilderness, and he was not in the company of them that gathered themselves together against the LORD in the company of Korah; but died in his own sin, and had no sons.27:4Why should the name of our father be done away from among his family, because he hath no son? Give unto us therefore a possession among the brethren of our father.27:5And Moses brought their cause before the LORD.27:6And the LORD spake unto Moses, saying,27:7The daughters of Zelophehad speak right: thou shalt surely give them a possession of an inheritance among their father's brethren; and thou shalt cause the inheritance of their father to pass unto them.27:8And thou shalt speak unto the children of Israel, saying, If a man die, and have no son, then ye shall cause his inheritance to pass unto his daughter.27:9And if he have no daughter, then ye shall give his inheritance unto his brethren.27:10And if he have no brethren, then ye shall give his inheritance unto his father's brethren.27:11And if his father have no brethren, then ye shall give his inheritance unto his kinsman that is next to him of his family, and he shall possess it: and it shall be unto the children of Israel a statute of judgment, as the LORD commanded Moses.27:12And the LORD said unto Moses, Get thee up into this mount Abarim, and see the land which I have given unto the children of Israel.27:13And when thou hast seen it, thou also shalt be gathered unto thy people, as Aaron thy brother was gathered.27:14For ye rebelled against my commandment in the desert of Zin, in the strife of the congregation, to sanctify me at the water before their eyes: that is the water of Meribah in Kadesh in the wilderness of Zin.27:15And Moses spake unto the LORD, saying,27:16Let the LORD, the God of the spirits of all flesh, set a man over the congregation,27:17Which may go out before them, and which may go in before them, and which may lead them out, and which may bring them in; that the congregation of the LORD be not as sheep which have no shepherd.27:18And the LORD said unto Moses, Take thee Joshua the son of Nun, a man in whom is the spirit, and lay thine hand upon him;27:19And set him before Eleazar the priest, and before all the congregation; and give him a charge in their sight.27:20And thou shalt put some of thine honour upon him, that all the congregation of the children of Israel may be obedient.27:21And he shall stand before Eleazar the priest, who shall ask counsel for him after the judgment of Urim before the LORD: at his word shall they go out, and at his word they shall come in, both he, and all the children of Israel with him, even all the congregation.27:22And Moses did as the LORD commanded him: and he took Joshua, and set him before Eleazar the priest, and before all the congregation:27:23And he laid his hands upon him, and gave him a charge, as the LORD commanded by the hand of Moses. What blessings might you miss like Moses if you do not continue in obedience? Why was Joshua chosen to succeed Moses? How did God honor Zelophehad’s daughters? How was Moses’s compassion for the people displayed after God told him he was going to die? Humbly serve someone who has hurt you today.